The Art program is designed for both students who plan to transfer to a four-year college, university or design school and students seeking an introduction to art. The curriculum at CCRI is the equivalent of the freshman and sophomore years in many four-year bachelor's degree programs in art or a foundation program at a design school. The art curriculum is structured as an introductory level for non-majors, the foundation level, specialized disciplines and intermediate level. Students enrolled in the A.F.A. degree program should work closely (beginning in the first semester) with full-time faculty members from the Art Department in selecting and sequencing courses. Students should check the transfer requirements of the four-year program for which they are preparing and retain all of their work in a portfolio. Students should take a balance of general education and major requirements each semester. Where possible, take courses in the order they are listed here starting with the 1000 level and moving up to the 2000 level. Studio courses are demanding and require extended blocks of time. See course descriptions for details. 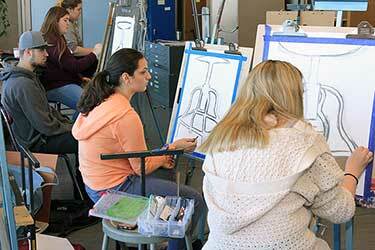 Complete major requirements before enrolling in any visual art elective courses. Do not enroll in more than one art history course per semester.